Do we remember the rain and cool weather? I hope all of you celebrated a typical hot Independence Day and remembered our service men and women. 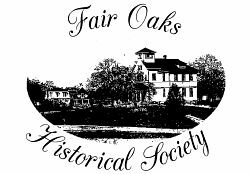 The Fair Oaks Historical Society has a very special Board and I Wish to thank the Board members for the support they are giving the community and FOHS. Our past history for this community is available to everyone for all of us to enjoy. The community potlucks are fabulous samples of good food made by historical society members! Steve created the "Fair Oaks Map"
display during June at the library. “60 Years of the Fair Oaks Rotary Club"
Our guest speaker for July will be Jim Purcell the president of the Fair Oaks Rotary Club. Jim will tell us the history of the Fair Oaks Rotary Club. The Rotary has been in existence for 60 years and contributing to the Fair Oaks community through many service projects big and small. Some of the projects have been the Annual Crab Feed in February, the Fair Oaks Fiesta in May, the Renaissance/Tudor Fayre in June, and Oktoberfest or course in October. Members volunteer at the High Schools, distribute Christmas baskets, donate blood, and serve on community, civic and non-profit boards. The last project completed by the Fair Oaks Rotary Club was the Clock Tower in downtown Fair Oaks. If you have an idea or suggestion for a future program topic please let me know. I want to bring historical topics of interest to all of you. I can be reached at (916) 944-4812 or via my e-mail address at sherrywood1949@comcast.net. Great news, a new book is coming out soon in the Images of America Series by Arcadia Publishers showing the history of Fair Oaks through pictures. 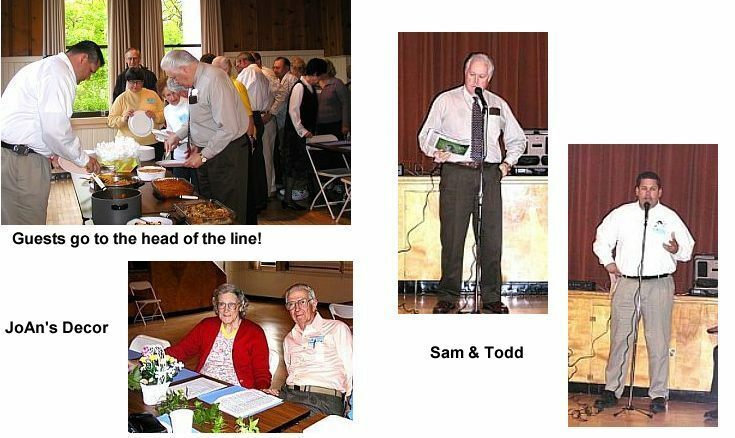 Dr Lee Simpson and Public History PhD candidate Paul Sandul of Sacramento State University are publishing this book with the cooperation of the Fair Oaks Historical Society, many of its members, and other citizens of Fair Oaks. We are looking for help from those who may have older pictures showing life in Fair Oaks from the 1970s back. Examples: houses, buildings, structures, scenery, family members, school portraits, community gatherings, picnics on the river, and pictures of Old Town. The book is about the community and its residents, so pictures of old Grandma Martha and Uncle Jim are exactly what we are looking for. Paul will make copies of your pictures that you want to share (your original pictures will not be damaged during the process). The Fair Oaks Historical Society is helping to put this book together by offering their support, contacting various community organizations, schools, churches, and citizens on behalf of the authors. Royalties gained from this publication will be given to the Fair Oaks Historical Society in return for their help. All copies of the pictures gathered, whether they are used in the book or not, will be given to the Fair Oaks Historical Society to add to their collection and for the further preservation of Fair Oaks’ proud and wonderful history. If you have any old pictures you would like to share, know of anyone who would have any old pictures, or if you have any questions about this project, please contact Paul Sandul at 916-966-0751 or by e-mail at psandul@csus.edu. 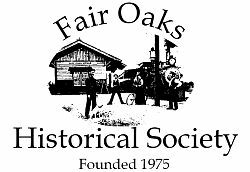 The Fair Oaks Historical Society, Dr. Lee Simpson, and Paul Sandul would like to thank you in advance for your help and support on this project. The Executive Board wishes to thank Ralph Carhart, Warren McWilliams and Pete White for serving on a committee to review the logo submissions. 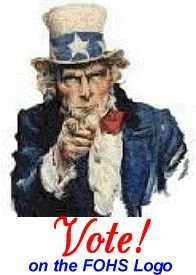 The ballot for voting your choice is in this newsletter. The winning entry will be posted on our website and appear on the next issue of our newsletter! 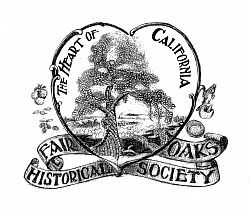 Steve Abbott, Logo # 1 - In all probability, at the April meeting of the Society you will be choosing a logo to represent the Fair Oaks Historical Society. This logo should reflect the foundation of our community from its birth in 1895. Some of you have not had the opportunity to study the origins of our town. 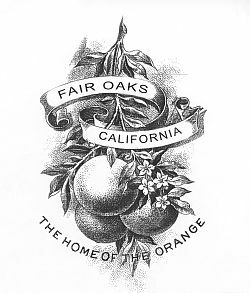 None of you were here at the beginning, and the oldest of you were only children at the end of Fair Oaks agricultural Golden Age before the Great Depression. Consequently, our earliest history, our earliest residents, our earliest businesses, and our earliest institutions are unfamiliar to some of you. 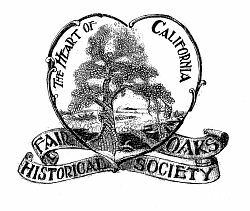 It is the primary purpose of the Fair Oaks Historical Society to discover that history, to preserve that history, and to transmit that history. And therefore, in choosing a logo, it is incumbant on each of us to choose that symbol which most closely represents why people chose to leave the East and how they struggled to make a living during the early years of our history. The first residents didn't come to the colony because of the American River. They didn't leave their homes and families in the East and Midwest because of the oaks trees. They didn't come to mine gold. They came either to raise agricultural products that were not grown in the East and Midwest or to service those who did come to raise the produce. No agricultural product was more seductiue to these aspirants than citrus, the orange foremost among the several varieties. At first, the climate was their friend. but it turned against them in 1932, and they realized that their economic futures depended on their ability to adapt to other sources of income. In selecting the orange as a symbol to represent our society, you will be choosing the very fruit that the earliest developers most used in their promotional material and the fruit that was foremost in the hopes of the earliest colonists. Hugh Gorman, Logo #3 & # 4 - My drawings are actually studies intended for discussion, not as a final design. The images are drawn from a developer's enticement called "The Heart of California", published by Howard and Wilson in Chicago, 1897. It touted Fair Oaks, sitting high on the bluffs along the American River, with its "delightfully picturesque" views. The oak depicted on the bluff could as well have been an orange. Or, we could have a laugh and draw oranges on an oak tree. There could be period picnicers in the foreground eating Fair Oaks' famous bounty. There's lots to talk about.... my idea of a good logo is the Seal of the State of California. That would make a great model to draw from. What images are depicted should come from the membership. It seems premature to design without discussion, direction and consensus. We could all submit our ideas, put them all on a ballot, and everyone vote. With that kind of information, a design would form rather easily, and I for one would be ready to give this logo idea a serious go. I would of course work as a volunteer, just as so many of you do. Each member in good standing has one vote. Family memberships are entitled to two votes. Votes may be mailed to: F.O. Historical Society, PO Box 2044, Fair Oaks, CA 95628 or brought to the general meeting on July 26th. #2 - Submitted by Anonymous. We're making incremental improvements to the website. 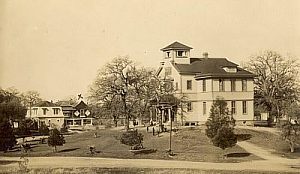 Check out the new "History of Fair Oaks" by Steve Abbott; and Steve and Jim have annotated all the Post Cards (under "Photo Gallery" on the home page) to identify the location and direction each photo. We're waiting for the new museum inventory software to arrive, and will not only be entering the inventory of items in the FOHS History Center, but as part of that process we'll be photographing or scanning all of the items in the museum. Those photos and the identifying narrative will give us a head start on a "Virtual Fair Oaks History Center" on the website. As always, we welcome your comments and suggestions. Please check out the website at www.fairoakshistory.org and give any comments to Jim Pearce or e-mail to webmaster@fairoakshistory.org. 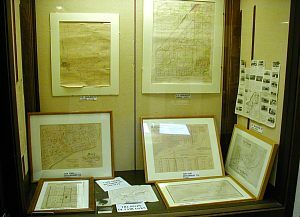 During the Fair Oaks Fiesta, April 30-May 1, 38-plus people signed the register as visitors to see our display in the Old Library. Many THANKS to Diana Lennon, Rose Anne Lamb, Marguerite Goddard, Bill Hinsey, Marilyn Pearce, Mary Dobrowolski, Lois Frazier, Fran Sargent, Meg and Larry Smart. On May 28 the 7th annual Memorial Day celebration at the Fair Oaks Cemetery was very well attended. An estimate of 300 people enjoyed special music, speakers and refreshments. Thank you everyone who brought cookies and also attended the ceremony. Bill Hinsey was the docent on June 12 at the History Center. Several visitors came to see our displays and indicated they would come to the potluck in July. The following people have also been docents this year. 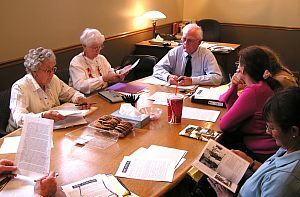 Fran Sargent, Lois Frazier, Larry and Meg Smart, Gordon and JoAn Heidt, Rose Ann Lamb. Thank you very much. 1. 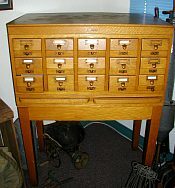 The Society would like to sell 2 oak card catalogue stands each for $75. They are located at the F.O. Museum at the cemetery on Olive St.
2. 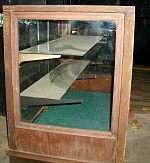 Farmer Bob has been storing for the Society an oak display case to be sold for $100. It was purchased in Grass Valley some time ago and because of space limitations can’t be used at the museum. call Steve Abbott at 631-8019. The Board of Directors passed a motion recommending the establishment of a Memorial Program for the F.O.H.S. A Memorial Program is a very significant way to remember the departed. The names of those remembered and the contributors will be inscribed in a “Memorial Book” that will be on permanent display at the History Center. An example is the donation received this spring from the Larson family in honor of Fred Easterday. Funds donated will go into a fund kept separate in our business savings account for a use to be determined at a later date. Comments: This brick-face "cottage-style" home perched on a knoll set back from the street was a statement by its original owner-builder Bert Hild, who encouraged home building in the planned "Fair Oaks City". Hild worked for the State Agricultural Department and as a postmaster in Fair Oaks and served as manager of the Fair Oaks Homebuilders Assn. He and his wife Mable, according to the Fair Oaks Progress, entertained over 70 neighbors at their popular annual 4th of July lawn party, and Mrs. Hild entertained the Christmas Club "at her home 'Hildcrest"'. Bert gave priority to landscaping, carefully selecting trees to beautify the lot, and planting quantities of iris (which, it is discovered, do no attract munching deer!). Ed West, a supervising construction inspector for Sacramento County, purchased the home in 1959 at an estate sale. As a youngster he often hitchhiked out from his family home in Carmichael to swim in the river and see the Saturday movie at the Community Center, on which occasions he often passed, and admired, Hildcrest - not realizing that one day he would live there and rear a family of six rambunctious children! Now retired from the County and construction work and recently acquiring the title Great Grandfather, Ed carries on the Hild tradition of foresting and grooming his knoll.